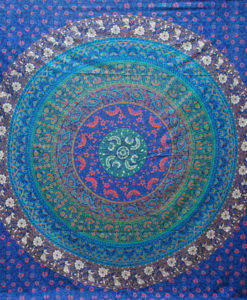 Our Hippy Wall Hangings (or tapestries) are a great addition to your home (or tent/campervan). We have a wide variety of designs and they look great as throws for sofas or beds, as a blanket, backdrop – pretty much anything! Some of our hippy wall tapestries have a deeper meaning and can be used in certain rooms or places in your house to bring positive vibes to your home. Check out the product description for the hidden meanings/explanations (or not so hidden for the enlightened ones!) on all our Hippy Tapestry. All Tapestries are hand made in India by a screen printing process on cotton fabric, and come in many different colours and designs. At present, we only stock double size wall hangings, but if you require single size then drop us a message and we will do our best to get you your desired tapestry. Over the years we have seen many different uses for these hippy throws. Cover your sofa or bed to give your home a new design feel. Hang them from walls bring an amazing focal point to any room. Use them for curtains in your home or camper van for a great effect. Being light weight they are a great addition to your festival bag to either use as an extra bit of warmth when needed, or a simple sun screen when put between a couple of tents. Whatever your use, make sure to have a good close look at our many designs and all the colours they come in, we are confident that you will find the perfect hippy throws to fit your needs.